I captured the above photo with Nikon D7000 and Nikkor 10-24mm ultra wide angle lens attached. Photographed in Program Auto mode, with Shutter speed 1/250 sec. Aperture f8.0. Focus distance was set to 10mm. ISO 100. Auto White Balance. No flash fired and +1/3EV exposure value being compensated with Matrix metering. This photo was post processed with Adobe Photoshop Element. View the full size photo in my Flickr albums. 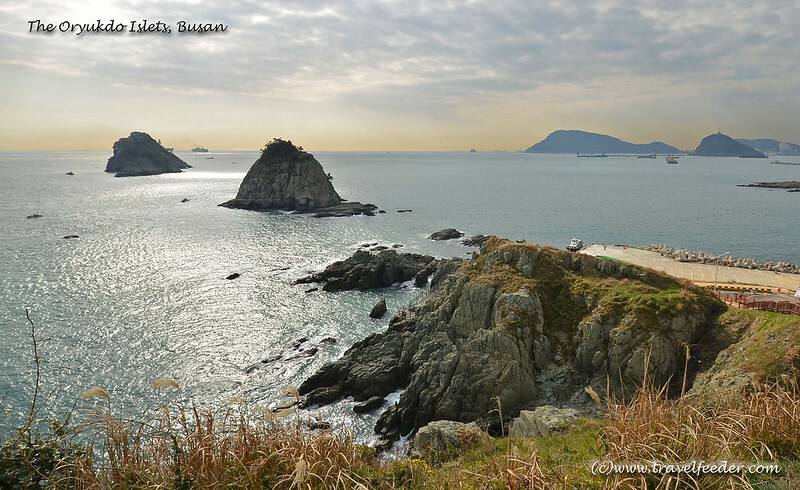 The Oryukdo Islets are a group of rocky islets located Southeast of Seongdumal region of Busan, Korea. They were designated as National Heritage No. 24 by the cultural Heritage Administration on October 1, 2007. Because of the strange shape of their peaks and mountain standing side by side, the Oryukdo Islets seem to have six peaks seen from East and five peaks from the West. Oryukdo means five six islands in Korean, or ??? in Chinese. There is also saying that because of the double peaks of one of the stone islands Usakdo, people will either see five or six islands in different time of day with different tide level. I took this photo from the Oryukdo Skywalk, a cantilevered glass viewing platform stretching out to the sea for better vantage point. The Oryukdo islands do not look particularly amazing at first glance. Nevertheless, by knowing how significant they are as a symbol of Busan when many ships coming to Busan will pass by them, I started to appreciate them. Moreover, the attractive surrounding coastal area is well worth a stop on your Busan travel, albeit with a bit of walk if you come by trains or buses. As a new attractions of Busan since 2013, the Oryukdo Skywalk should be part of your Busan itinerary if you love Busan as much as I do. Check out more stories on this blog for my other Busan travel experience. The post Travel Snapshot – The Oryukdo Islets of Busan appeared first on Travel Feeder.